I love zucchini. I eat it year round. It's my absolutely favorite weeknight vegetable since it's so easy to prepare. Just slice them up and put them in some boiling water with a pinch of salt. I could eat it every night. And I actually make zucchini bread because I really like it not just because someone had a bumper crop of zucchini. Zucchini bread was one of the first things I ever baked on my own. When I was 15 my best friend Nora gave me a recipe for zucchini bread and she said it was easy and delicious. I thought it was strange to have zucchini in a dessert, but I tried it and she was right about it being delicious. All through my high school years I made zucchini bread over and over again. I remember sitting at the dining room table grating the zucchini by hand with my mom's old box grater. Even to this day I grate zucchini by hand. I know it's faster to use a food processor, but I like doing this particular task by hand. But whether you love zucchini like me or just tolerate it, when zucchini is combined with chocolate it can't be bad. When I saw this chocolate zucchini cake recipe on the King Arthur Flour website I just had to make it. It definitely uses more chocolate than zucchini. I think the zucchini is more for moisture and texture than flavor. But every once in a while you'll encounter a green fleck which I find rather pretty. Regardless of the reason, it's a good way to add more vegetables to your diet. 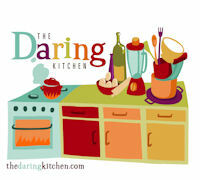 I am giving away the King Arthur Flour Whole Grain Baking cookbook. 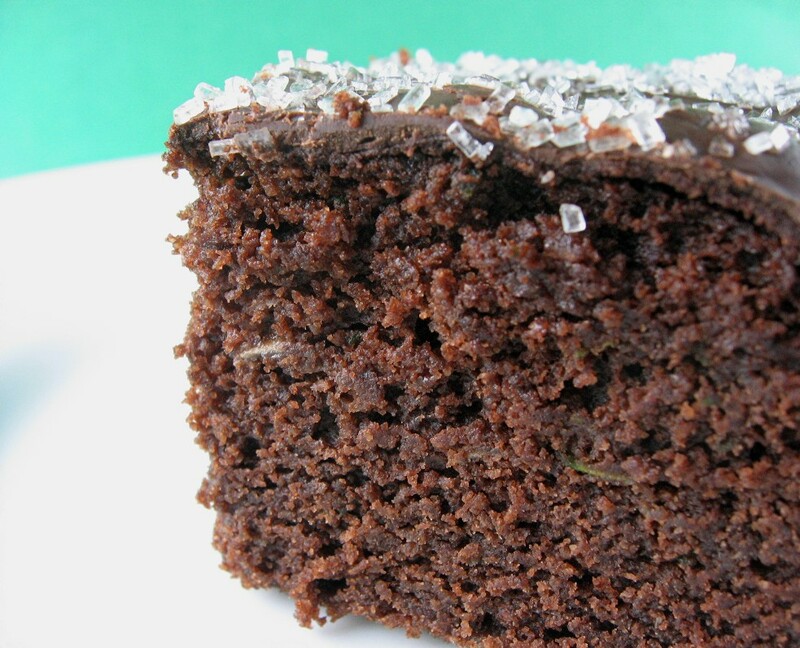 (The cookbook has a whole wheat flour version of this chocolate zucchini cake too.) Please leave a comment on this post before 11:59pm PST on November 12, 2009 and be sure to mention your favorite vegetable. I will select one comment at random. I plan to contact the winner by email so please make sure you have a valid email address associated with your user ID. Unfortunately I can only ship to U.S. addresses. My sincerest apologizes to my international readers. Preheat oven to 325F. Lightly butter and flour a 9" x 13" baking pan. In a large mixing bowl, cream together the butter, oil, sugar, vanilla, baking soda, baking powder, and salt. Beat in the eggs. Stir in the sour cream or yogurt alternately with the flour. Then add the cocoa and espresso powder, mixing until smooth. Finally, fold in the zucchini and 1/2 cup chocolate chips. Spoon the batter into the prepared pan. Bake cake at 325F for 35-40 minutes, or until the top springs back lightly when touched, and it seems set. Take the cake out of the oven, sprinkle it evenly with the 1 cup chocolate chips, and return it to the oven for 5 minutes, or until a cake tester inserted in the center comes out clean. Remove the cake from the oven, and use an icing spatula or rubber spatula to spread the chocolate chips into a smooth glaze. Sprinkle with coarse sugar (if using). Cool on a rack. * The recipe on the King Arthur Flour website uses 3/4 cup cocoa, but I like using only 1/2 cup cocoa. Oh oh oh! Zucchini! It is so perfectly delicious - I used to loathe the stuff, and then I moved close to a lovely Japanese hibachi restaurant where they have the most incredible grilled zucchini. Oh, my mouth waters just thinking about it. But this is a different class unto itself - I can't wait to try this recipe! Thanks for posting. I make a chocolate zucchini cake that's one of my favorite chocolate cakes. Most people are skeptical of it, but are converted after just one bite. I love zucchini - zucchini casserole and bread - I also like cucumbers. I like to slice them thin and add shrimp and a vinegar/sugar mix. I larned how to make cucumber pickles over the summer. That cake looks so moist and delicious! I love zucchini too, but they are almost out of season where I live. That cake looks gorgeous. My favorite vegetable...I'm going to say eggplant! My favorite is asparagus. Or beets. I never met a vegetable I didn't like. This cake looks real great! It took me two years to accept the fact that zucchinni does work in a cake! My favourite veg would be the potato. Broccoli. Definitely broccoli. I wonder if I could work that into a cake? Ooh, it's hard to pick just one favorite vegetable, but when it comes to baking, I'd have to choose pumpkin. Non-baking favorite veggie would have to be broccoli (lightly steamed)- so delicious. I'm still working my way up to fully embracing zucchini. I'll gladly use it, chopped fine, in soups or lasagna, but am not a fan of it cooked just by itself. wow, I'm not a big zucchini fan, but that looks so good! my favorite foods tend to vary with my moods, but my current favorite veggie is asparagus. I'm craving some right now! Right now I'm loving roasted carrots. Maybe a little olive oil, or balsamic, or maple syrup added too. So good! This recfipe looks so good I tweeted it - then realized I just lowered my chances of getting the cookbook. Am going to make this this weekend. Love King Arthur flour. This recipe sounds wonderful, will have to try it. I just made the whole wheat version of this cake from the kaf whole grain baking this morning. It is really delicious. I love how the zucchini just kindof melts into the cake. I have made chocolate chocolate chip zucchini muffins and they are soooo good! This cake looks like its along the same lines. When I was a kid and my mom made zucchini for dinner, my brother and I would hold our noses so we couldn't taste it as we were eating it. Pretty slick move! But now I gladly cook zucchini for myself whenever I have the chance. Broccoli is my fav. this recipe sounds so interesting, I must try it. Gosh I don't know if I could pick a favorite vegetable. I could say my top 5 maybe- broccoli, pumpkin, spinach, sweet potatoes, and artichokes. Oh, and I cannot wait to try your pumpkin thing! I forwarded your post to my mother and she will probably make it as well. Hands down its asparagus! I just love asparagus paired with a good hollandaise sauce or with olive oil and thinly sliced mozzarella cheese. My favorite vegetable is cauliflower, especially when it's roasted! Thanks for sharing your zucchini love (and our recipe) with other bakers. How generous of you to also share the whole grain goodness! I grew up grating zucchini by hand for my grandma to make zucchini bread. Thanks for the recipe! So many vegetables I love...but I'd say boiled kale is at the top of my list right now. Ooh! I came into liking zucchini later in life. It wasn't until well into my 20s that I really started to enjoy it. I've gotten my Special Education students suspicious of which veggie I'm sneaking into treats now... carrots, zucchini and cauliflower no longer surprise them. Yes...zucchini is my favorite veggie! It's SO versatile - roasted, baked, sweet, savory - perfect. 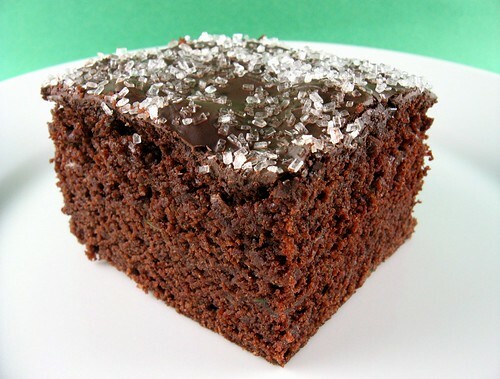 Haven't ever had a chocolate zucchini bread but I'm sure it's yummy. i too make zucchini bread because i like it. and love it in various other forms also. it is certainly one of my "go to" vegetables when i can get it fresh. I love zucchini bread too. Can't wait to try out this recipe! Thanks for sharing. My favorite vegetable... Hmm. Right now I've been going through a sugar snap pea craze! Oh gosh, I can't just choose one! Top three: broccoli, brussels sprouts, and butternut squash (I swear I like more than just those that start with "b"--just a weird coincidence! Thank for the contest. Every KA recipe I've made off the site has been fabulous (english muffins esp) so I'm sure the book is equally wonderful. i heart that book. thanks for the giveaway! my favorite vegetable, by far, is spinach. i don't think that it would go well with chocolate ha ha. I had a bumper crop of zucchini, and I think I made every creation of zucchini possible. I have lots of it in the freezer to keep me in zucchini dishes all winter. I think my most favorite vegetable is corn. Corn on the cob!! I too love zucchini, and zucchini bread was one of the first baking advenures I had! Beets or cabbage, cooked Ethiopian style. Ooo that cake looks delicious! My favorite veggie is the potato. You can't go wrong with a potato: boiled, baked, fried. I love it! That cake looks awesome, guess I will have to raid mom's garden for her monster zucchini. As for favorite vegetable, I'd say its a toss up between carrots and artichokes. Yum! It's hard to choose just one, but I love cauliflower. My favorite vegetable right now is roasted cauliflower--ever since I tried it roasted, I love it! Love all veggies, but if I since I need to pick one it would be gai lan, chinese broccoli. This cake looks so yummy and will be making it soon! Huge fan of tomatoes. But is it a fruit or a vegetable? My favorite veggie has got to be carrots! Easy to find, delicious and colorful! Plus your carrot cake recipe makes my taste buds dance and sing! Right now, I really like carrots because I can disguise it in drinks and food for my 2-year picky non-vegetable-eating son. I look forward to trying this recipe for him (and well, myself, too). I must say - your meyer lemon bar recipe is to die for - I look forward to testing out this recipe. My favourite vegetable to use in desserts is carrot. I make an Indian carrot pudding that is just delicious! I have a great recipe for zucchini chocolate chip bread, but I am completely intrigued by the idea of a chocolate base! I am late on the feeback but am a friendly norther neighbour so would not qualify for the cookbook. My favorite vegetable would have to be butternut squash. I would say tomato as I eat one or two a day but most people consider it a fruit. Thank you for being such a baking inspiration. I've made many a recipe from your blog and been all the more popular for it. Great photos as well! I can't find dutch processed cocoa anywhere! Can I substitute regular cocoa powder? Rachel - For this recipe, using regular natural cocoa powder should be fine.